July 21, 1963 –In a pictorial essay, the Chicago Tribune highlights the “building boom” that is under way in the city, highlighting five big projects: (1) Carl Sandburg Village on North LaSalle Street; (2) the Outer Drive East apartment on Randolph Street near the lakefront; (3) the new federal office building (now the Dirksen Federal Courthouse) on Dearborn Street between Adams and Jackson; (4) the new Midwest headquarters of the Equitable Life Assurance Society of the United States on Michigan Avenue between the river and the Tribune building, and (5) the Civic Center (now the Richard J. Daley Center) just beginning to rise just east of the City-County building on Clark Street. These were heady days in the city, as bold new structures rose throughout the decade in the city that worked. The model for Sandburg Village, minus the brick walls that hide everything from view, is shown in the above photo. July 21, 1919 – The lead in today’s Chicago Daily Tribune packs a powerful punch, “Not since the disastrous fire of ’71 has the city council at any one meeting considered improvement ordinances of such far reaching effect.” This is the day that the city council votes on a budget package that will potentially lead to more than $195,000,000 in city improvements, including the completion of a bridge across the river at Michigan Avenue. There is apparently no opposition to the plans. “So anxious are the large majority of the aldermen to make Chicago go ahead that it is proposed now that plans be considered at once for initiation of improvements next year,” the Tribune reports. [Chicago Daily Tribune, July 21,1919] Bond issues will lead to the widening of Ogden, Ashland, Western, Robey (now Damen), and South Water Streets. Two million dollars will cover the cost of finishing Michigan Avenue. Up to $30,000,000 will cover “reclaiming and improving submerged lands between Grant and Jackson parks.” Aside from the money involved, the council will ask for an investigation of civic improvements in Detroit, Cleveland, Cincinnati, St. Louis, Kansas City, Omaha, Minneapolis and St. Paul because “Charles H. Wacker of the Chicago plan commission has repeatedly stated that these cities are attempting to become real rivals to Chicago in trade, commerce, manufacturing and municipal improvements.” The above photo shows the proposal of the Chicago Plan Commission for eliminating the South Water Street markets and improving the area just south of the river. 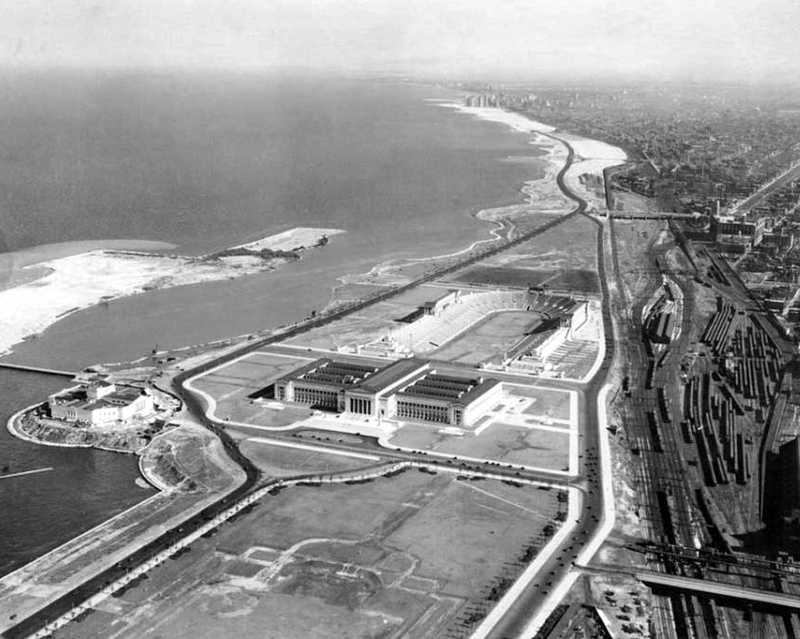 July 21, 1919 – The Chicago City Council passes two huge ordinances that will, together, have an immense impact on the future of the city. One is the lake front development ordinance, adopted by a vote of 66 to 2. This decision ratifies an agreement between the city, the South Park Commission, and the Illinois Central Railroad, restricting development on the lakefront from the Chicago River all the way to Forty-Seventh Street. The other act submits bond issues for street improvements totaling $28,600,000 that will be on the ballot for approval in November. Charles H. Wacker, head of the Chicago Plan Commission, says, “This is the greatest day, barring none, in Chicago’s history. It means more to the growth, development, and greatness of the city than anything which has heretofore happened . . . When these improvements are completed this city will have passed from the provincial town class to a real metropolitan city.” The photo above shows the lake front five years later in 1924.